Once the sun has disappeared for the day, give your home a spooky look with multicoloured, painted mason jars. These little jars can be assembled the day before Halloween and illuminated with small, battery-operated votive candles or a string of mini lights. They are wonderful for lighting up the front door path or adorning your mantel for an All Hallows’ Eve gathering. Use them as a centrepiece for your Halloween table as well. There are actually two ways you can put these Halloween decorations together. The first is to simply pour the paint into the bottom of the jar and roll it completely around the inside of the jar to coat the inside. If you choose this method then you will have to make the jars a few days ahead to let them dry. This method works really well for a nice, thick coat of paint. The second option is to use a paintbrush to paint the inside of the jars. This method is equally as effective; however, you may have to paint the inside of the jar with two to three coats of paint. Acrylic paint dries very quickly so you should be able to do them one day ahead. Once the inside of the jar is completely painted you can add the various decorations on the outside of the jar. 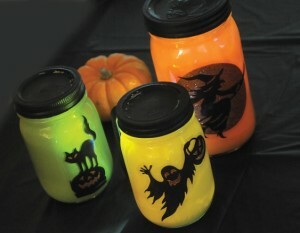 Another way to decorate your jars is to use a paintbrush and paint small ghost faces on the outsides. This is a great idea if you plan to group the jars together as a display. Add your battery operated tea lights and watch them glow. Or use a mini light strand to group five or six jars together in a corner by your front door, or along your front path. You will require an extension cord for this option. Remember to turn off the tea lights and unplug the mini light strand once the evening is over.